It appears that Catholicism in the United States is shrinking at an accelerating rate. But many of my fellow Catholics in Atlanta would scoff at such claims. We are building more churches and schools every year. The Atlanta Archdiocese is bursting with more than 1.2 million Catholics. As a point of comparison, when I was born in 1959, the entire north of Georgia, including Atlanta, had about 30,000 Catholics. Where did all the Catholics come from? Catholic migration has been rapid from the Northeast and Midwest. In 1972, roughly seven in ten Catholics lived in either the Northeast (41%) or the Midwest (28%). Only about one-third of Catholics lived in the South (13%) or West (18%). Today, a majority of Catholics now reside in the South (29%) or West (25%). Currently, only about one-quarter (26%) of the U.S. Catholic population lives in the Northeast, and 20% live in the Midwest. There has also been a massive influx of Hispanics into North Georgia which is a key part of the rapid increase in Catholicism in the South. This rapid recent growth of Catholicism is an anomaly to the Southeast and Southwest of the United States. Between 2007 to 2014, the percentage of Christians, according to a Pew Foundation poll, in the United States was reduced from 78.4% to 70.6%. Catholics have seen part of this exodus, moving from 23.9% to 20.8% of the US population in just seven years. The Catholic Church is losing more than a third of those who were raised Catholic. Among the 31.7 percent of Americans adults who say they were raised Catholic, 41 percent no longer identify as Catholics according to the Pew Research Center’s 2014 Religious Landscape Study. As this evidence suggests, the current lament that the Catholic Church is the largest denomination and ex-Catholics are the second largest denomination in the U.S is fairly accurate. After decades of remaining steady because of an influx of Catholic immigrants, Catholicism like other faith traditions is shrinking rapidly in the United States. What is behind this shift? We are not doing well especially with millennials. The percentage of unaffiliated former Catholics in ages 18-29 is 38% compared to those in ages 65+ at only 12%. Millennial Catholics are three times more likely to not have a Catholic affiliation than their baby boomer elders. 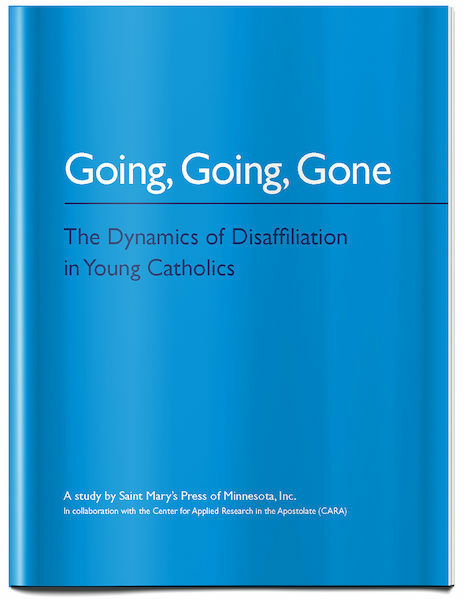 If you wish to find out about why young Catholics are abandoning the Church a good place to start is Going, Going, Gone: The Dynamics of Disaffiliation in Young Catholics. This book is a project of the St. Mary’s Research Group and the Center for Applied Research on the Apostolate at Georgetown University that surveyed disaffiliated young Catholics. There are some interesting aspects to this research. One of the most shocking was that the average age for leaving the Church was thirteen. In addition the study found that disaffiliation is a process that happens over time for young people, often prompted by a series of events or unresolved questions that accumulate over time. The report stated that many disaffiliated youth believe in the core messages of Jesus, but they perceive organized religion as having corrupted Jesus’ fundamental teachings. They see the church’s dogmas and doctrines as not making sense, and they believe they can live more moral lives without the trappings of an organized religion. Many perceive that religion was forced on them, and they report feeling freer and happier without the burdens of an organized religion. I will turn to solutions in part 2 of this set of articles. But, let me end this article with a warning about what will happen if current trends hold and we do nothing. Let us assume that Catholics continue their roughly .5% per year decline of recent years then Catholics would shrink from 22% of those who are affiliated, to 6% of the U.S. population in 2050. We will be no different to any significant degree from modern day Europe or Canada. The incredible shrinking Church will have reduced Catholics to a very small minority indeed. The good news is that we can recognize this trend and try to reverse the decline.